Manna Pro Chick Starter is formulated for the development of active immunity to Coccidiosis and for increased rate of weight gain and improved feed efficiency in replacement chickens. Medicated with Amprolium. 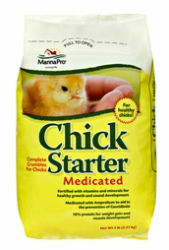 Chick Starter is a complete crumble for chicks for 0 to 8 weeks. It has 18% Protein for weight gain and muscle development and it is fortified with vitamins and minerals for healthy growth and sound development. Feed Manna Pro Chick Starter-Medicated continuously as the sole ration to chicks from 0 to 8 weeks. Provide fresh, clean water free choice at all times. Caution: Do not use Amprolium in feeds containing bentonite. Warning: Use as the sole source of Amprolium. Feed Manna Pro Poultry Grit free choice in a separate feeder, or mix 1 lb with 40 lbs of feed. Grain Products, Processed Grain By-Products, Plant Protein Products, dl-Methionine, Calcium Carbonate, Monocalcium Phosphate, Dicalcium Phosphate, Salt, Ferrous Carbonate, Ferrous Sulfate, Copper Sulfate, Manganous Oxide, Manganese Sulfate, Zinc Oxide, Zinc Sulfate, Cobalt Carbonate, Calcium Iodate, Sodium Selenite, Vitamin A Supplement, Vitamin D3 Supplement, Vitamin E Supplement, Menadione Dimethylprimidinol Bisulfite, Thiamine Mononitrate, Riboflavin Supplement, Niacin Supplement, Choline Chloride, Calcium Pantothenate, Pyridoxine Hydrochloride, Folic Acid, Biotin, Vitamin B12 Supplement, Propionic Acid.